In August 2016 Sweet Note Bakery in Bensalem, Pennsylvania steamrolled a rebrand of their company to the Greater Knead. They wanted to expand their mission of creating authentic New York style bagels recreated gluten-free, to one that would also inspire change in the food industry, as well as offer an opportunity to market more allergen-free food products. When I first began working with them, they had a new logo, and new packaging for their bagels that included a large, eclectic font family. But they needed all new print material and they were in the preliminary stages of creating a new website. Working with the Greater Knead at this stage in their rebrand gave me the opportunity to design a massive variety of work ranging from business cards to packaging design, from large scale trade show banners to illustrations for their website. Some of the projects, including product labels, showed me what it is like to work with nutrition labels, ingredients lists and a variety of logos and guidelines all required for food packaging and marketing material, while being confined to a very small printing space. Yet, no matter the size or scope of the project, one of the most important aspects was always to convey the Greater Knead’s message of using only gluten-free and top allergen-free ingredients. The Greater Knead is serious about their mission, but they also have a fun and quirky side, which is why it was fun to design the shipping boxes for their bagels. Being limited to only one color (black) can be extremely freeing, especially when you take advantage of negative space like I did. The boxes also had to be functional by providing checkboxes for the products inside as well as letting customers know not to use blades when opening to protect their bagels. I could not resist drawing a bread knife for the icon on the top of the box. GraceD. Photography captured some incredible food photos of the Greater Knead’s bagels. These photos were a dream to work with for printed material like the posters, table tents and large scale banner. To support their mission and interest in recreating authentic food free from gluten and top-allergens, the Greater Knead had a lot of recipes to share. Based on the aesthetic of their recipe posts on their new website, I created a postcard sized template. “Eat Confidently” one of the Greater Knead’s slogans, seemed like a fitting background to use for the header for their new website. I love when I get to make illustrations useful. I created several custom drawings to be used for displaying the different ordering options for bagels and bagel chips. I also made outlined drawings of ingredients. The ingredients web page was a fun challenge. The Greater Knead team had a very specific vision of showcasing all the ingredients they used for their dough. For this project, I used high quality images to relay the transparent ingredients message, as well as hand drawn arrows to show a little more of the home-made, fun personality of the brand. The web developer Alex Millman made the ingredients page come to life. It can be viewed on the Greater Knead’s homepage. I’ve worked with the Greater Knead on a few different packaging concepts for their food products. The simplest have been sticker labels that they can print themselves and put on plain packaging. For their new line of bagel chips, we started out with a foil fin-seal chip bag, but ending up creating a design based on their bagel pouch style plastic bags. As a client, it can be intimidating having large scale trade show booth banners designed for you. They are expensive to have printed, so if the design is not quite right, it can be difficult to fix. 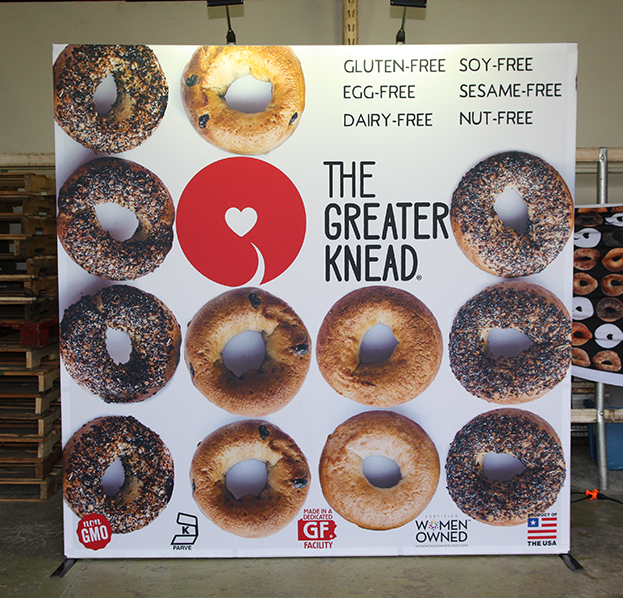 When working on this 8’ x 8’ banner for the Greater Knead, I tried to keep in mind where their exhibition table would be, what elements needed to be seen from far away and how the pattern of bagels would wrap around on both sides of the pop-up screen. The Greater Knead sends out periodic newsletters through Mailchimp. I created a simple header and some clickable graphics to be used as icons within the layout. Because they needed to easily update this newsletter, I created a custom template ready to drag and drop images and text. These vertical business cards feature a stacked composition, making them a little bit different from the standard align left crowd. The image of the bagel was printed with a spot gloss to add an extra pop effect. If a bagel sent you a postcard, what would it say?